The Spirit of Transportation relief sculpture by Karl Bitter at 30th Street Station, Dec. 18, 2018. Tom McKendry and his business colleague Brittany Santiago were walking through 30th Street Station when he pointed out something she had never seen before. 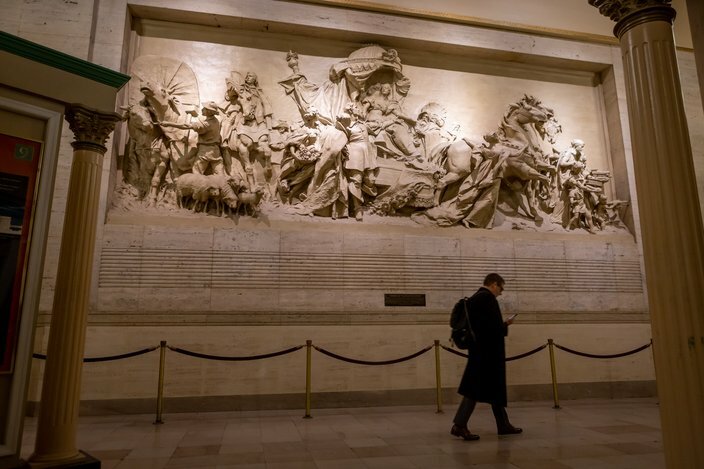 It was a 30-foot frieze from 1895 called The Spirit of Transportation, a sculpture depicting travel from ancient to modern and even futuristic times. “Next time you're here you want to take a good, long, close look at it,” said McKendry. Throngs of people who will be at 30th Street Station, one of the busiest transportation hubs in the East Coast, this holiday season waiting for trains to arrive or depart, and will have the opportunity to appreciate one of the city's art treasures. The Spirit of Transportation relief sculpture by Karl Bitter originally hung in Broad Street Station. 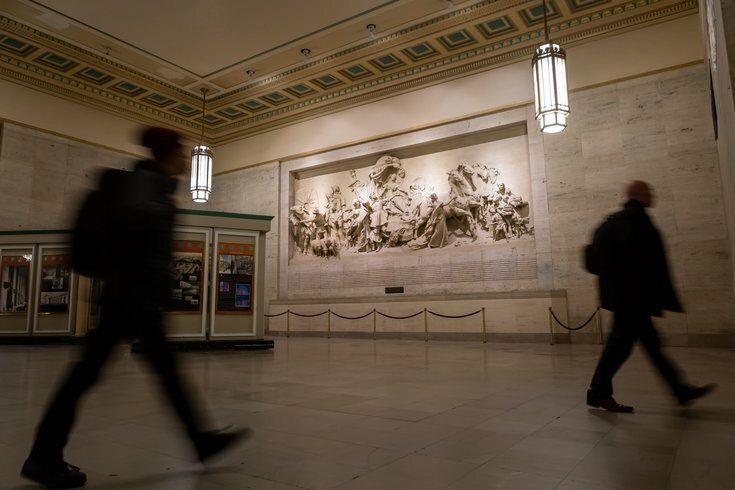 The art was then moved to 30th Street Station in 1933. The Pennsylvania Railroad commissioned Austrian artist Karl Bitter to provide numerous sculptures for its Broad Street Station, then Philadelphia's main train depot located adjacent to City Hall. Bitter came to America in 1889 and became a sought-after artist when he won a competition to design the Astor memorial bronze gates of New York City's Trinity Church. He went on to become one of the busiest and most acclaimed sculptors in the late 19th and early 20th Century. He was commissioned to create art for numerous public buildings in addition to Broad Street Station, including portrait portals for New York's Museum of Modern Art, a large frieze atop the Wisconsin State Capitol; bronze, life-sized statues of Thomas Jefferson and Alexander Hamilton that flank the entrance to the county courthouse in Cleveland and another statue of Jefferson for the University of Virginia. Among his surviving works in Philadelphia are two statues of Dr.William Pepper, Provost at the University of Pennsylvania; one outside of College Hall at the University and the other atop the main stairway at the Free Library of Philadelphia, and four terra cotta relief panels of musicians for the exterior of the Horace Jayne House, at 19th and Delancey Streets. Tragically, in 1915 a car jumped the curb on Broadway headed for Bitter and his wife. He pushed her out of the way but was struck by the auto, killing him. 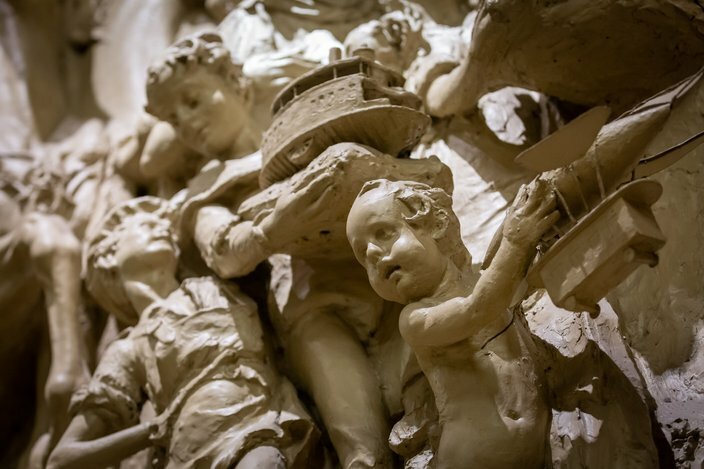 A child carrying a model of an airship in the relief sculpture, Spirit of Transportation, by Karl Bitter. On a recent afternoon, several people stopped to look at the sculpture, either for a quick glimpse (that became something more) or to make sure they remembered it as it was. Mark Diehl of West Philadelphia makes an effort to pass through 30th Street for his job so he can view the sculpture. He noted Spirit's raised figures almost reach out to the viewer. “It's like 3D,” he says. Ian Vandewalker of New York City frequently travels to Philadelphia on business, and always takes a peak at the sculpture. But he had never read the accompanying plaque describing the work and its history. He learned how Spirit was moved from Broad Street Station to 30th Street in January of 1933. At that time thousands saw it daily. Today, most people pass by it on their way to restrooms, or walking toward the main waiting room from the valet parking area or to stop by Amtrak's Acela Club. “On one hand it was an optimistic view of a future in which the railroad would continue to be at the center of transportation, and that progress is good thing,” said Theodore Xaras, a portrait artist. “The child – symbolizing the coming of the new century – holding a model of an airship... doesn't seem threatening. With hindsight, we know the airship, along with automobiles, were hardly more than toys in 1895, and would be the undoing of what the railroad stood for then. “So when I look at the sculpture I feel a mix of admiration for the amazing beauty of the piece, the skill and virtuosity of the artist, but tempered with a poignant feeling of the fragility of it all,” said Xaras, who teaches portrait painting at the Pennsylvania Academy of Fine Arts. Broad Street Station was demolished in 1952-53 to make way for Penn Center and new skyscrapers. Spirit might be the only Bitter piece that survived. Xaras says Spirit probably survived the wrecking ball because it was “move-able”; other artwork was on the station's exterior and could only be moved after demolition. But Brandt isn't taking chances. “This is probably the last time I'm going to be in Philadelphia for a really long time, and in case they decide to tear it down or whatever they want to do, I want to get (a reminder of it),” said Brandt, who now lives in Unadilla, GA. In mid-December he took photographs of Spirit.